Currently teaching in Perth Amboy, NJ at the Education Center. I began my education as a pharmacy major at a major university in Rhode Island. At the end of my first year of school, I decided that pharmacy was no longer the right choice for me, but I wanted to continue in a math or science related field. I refocused myself at Brookdale Community College ’05 as an Education major. This program allowed me to complete my necessary general education requirements, as well as allowing me to dabble in different content areas. After Brookdale, I was more focused and knew where I wanted to complete my Bachelor’s degree. 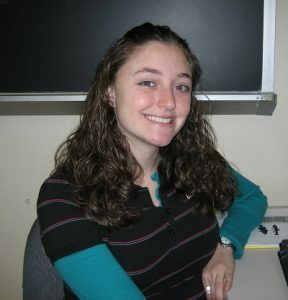 I began attending Monmouth University in the Fall 2005 as a Mathematics Education major. When examining which courses I had left to complete to finish my Bachelor of Science degree, I realized that my best option would be to continue as a strictly Mathematics major. Throughout my years at Monmouth University, I found myself spending all my time outside of class in the Math Learning Center working with other math students and professors to complete my coursework. With spending so much time in the learning center, I was approached by Judy Toubin, the center supervisor, to become a tutor. I continued tutoring students taking math courses throughout the rest of my college experience. This tutoring experience helped me to be sure of my decision to become a teacher. While taking my math courses, I found the faculty to be so helpful and supportive. I could always stop by their offices to ask questions or get help on coursework. I feel like I spent many hours in discussion with Dr. David Marshall and Dr. Joseph Coyle. I took a job working as a bookkeeper, after graduation in 2008, while applying for graduate school programs for a Master’s in teaching. While researching graduate programs, I stumbled upon a new accelerated Master’s program at Monmouth University. The moment I found that program I knew that it was meant to be. After a short 14 months, I completed my Master of Arts, Teaching (Secondary Education Mathematics) and was hired in Edison Public School district as an 8th Grade Math Teacher. Tara Ruda Bloom photographed in the Mathematics learning center in 2007. I worked in Edison for one year and was laid off due to budget cuts in district. This was a tough time for me, but I knew that I needed to move on. While looking for another public school teaching job, I worked part time as a tutor at Mathanasium and a pharmacy technician at Walgreens. I had also gotten a job as an Adjunct Professor at Brookdale Community College teaching basic skills math courses. Shortly after beginning at Brookdale, Dr. Marshall contacted me about becoming an Adjunct Professor at Monmouth. I taught at Monmouth for a full year and loved it. The students were great and the classes were interesting. During my second semester teaching at MU, I finally got a job teaching in Perth Amboy, NJ at the Education Center. This school is comprised of three different high school programs. I started teaching here in February 2012 and love working here every day. 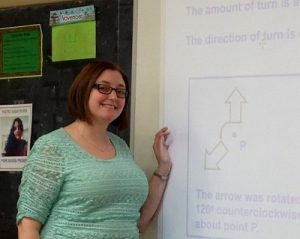 I currently teach Geometry to sophomores and seniors. I would not be the teacher, or person, I am today without the help of my professors and other students at Monmouth University. I feel like I would not be who I am today if I had gone anywhere else for my education. I love Monmouth University so much that I insisted my husband attend MU for his graduate school program. He will be completing his MBA this May. We also took our engagement pictures in Wilson Hall and in the gardens outside the Wilson Annex. I will also be attending Monmouth this February to participate in the Career Choices Roundtable in the MU School of Sciences.